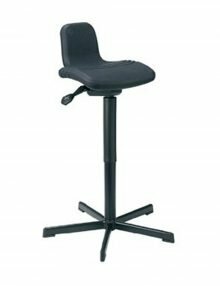 WE SELL THE COMPLETE RANGE OF SCORE CHAIRS. PLEASE CONTACT US IF YOU CANNOT SEE THE CHAIR YOU REQUIRE. The ideal solutions for Sit-stand work, Clean industry, Industry, Laboratory, Medical environment. Some work environments and activities are not suitable for an ordinary chair. For example, workplaces which require frequently alternating sitting and standing postures or workstations where there is little or no leg room. Amazone and Jumper are the viable, healthy and practical solution. 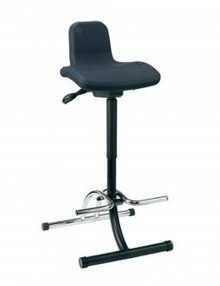 The “Amazone” is Score’s latest introduction to the sit stand stool market. It has a narrower version of the Jumper seat. 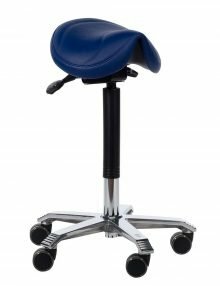 Both models feature an anatomically shaped saddle that allows the pelvis to tilt into the right position for a healthy, balanced and relaxed back posture. Spreading the legs in this way also enhances stability and enables users to get even closer to their work. Sitting on either Jumper or Amazone helps users to be more comfortable and, more importantly, more healthy! Available in various leatherette colours that are urine and blood proof and easy to clean with a damp cloth. The ideal solutions for Sit-stand work, Clean industry, Industry, Laboratory, Medical environment. Some work environments and activities are not suitable for an ordinary chair. For example, workplaces which require frequently alternating sitting and standing postures or workstations where there is little or no leg room. The Amazone is the viable, healthy and practical solution. 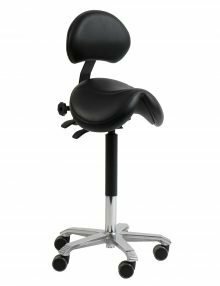 The Amazone features an anatomically shaped saddle that allows the pelvis to tilt into the right position for a healthy, balanced and relaxed back posture. Spreading the legs in this way also enhances stability and enables users to get even closer to their work. Sitting on the Jumper helps users to be more comfortable and, more importantly, more healthy! Available in various leatherette colours that are urine and blood proof and easy to clean with a damp cloth. The Amazone can be customised to suit your requirements. Please get in touch for more information. The ideal solutions for Industry, Laboratory, Medical environment. 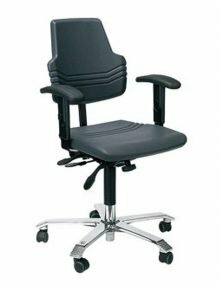 The 4400 Line Pro models embodies the very latest thinking in ergonomics and workplace design. With an aluminium base and polyurethane seat and back. The ideal solutions for Sit-stand work, Clean industry, Industry, Laboratory, Medical environment. Some work environments and activities are not suitable for an ordinary chair. For example, workplaces which require frequently alternating sitting and standing postures or workstations where there is little or no leg room. The Jumper is the viable, healthy and practical solution. The Jumper features an anatomically shaped saddle that allows the pelvis to tilt into the right position for a healthy, balanced and relaxed back posture. Spreading the legs in this way also enhances stability and enables users to get even closer to their work. Sitting on the Jumper helps users to be more comfortable and, more importantly, more healthy! Available in various leatherette colours that are urine and blood proof and easy to clean with a damp cloth. The Jumper can be customised to suit your requirements. Please get in touch for more information. Please note the image is of the Jumper High with Optional Backrest. The ideal solutions for Sit-stand work, Clean industry, Industry, Laboratory, Medical environment. 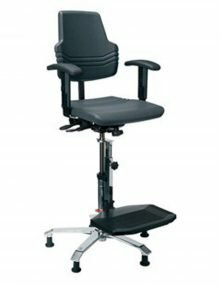 Designed for people whose work involves a lot of standing and can use a little extra support now and then.